communities in Australia and throughout the Caribbean. 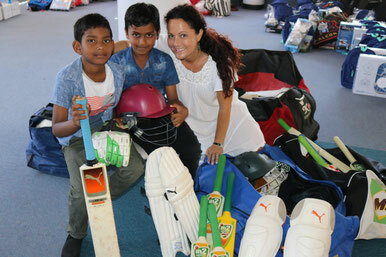 We have worked hard to foster a brighter future for cricket loving children providing the simple joy of access to sport. Between 2016 - 2019 our Kit Recycling Program donated the equivalent of five 20-ft shipping containers of new and used cricket gear to needy communities in NSW and the Caribbean. We also love organising cricket coaching sessions in Caribbean schools for visiting UK cricket teams wishing to make a positive social impact with Caribbean youth. Goodwill Distributions in Antigua & Barbuda, and Barbados. Community Care Refugee Program - Sydney, Australia. Children attending The Community Care Refugee Program Christmas party in Dec 2018 were happy recipients of an enormous equipment donation gifted to the Sri Lankan refugee community in Sydney. 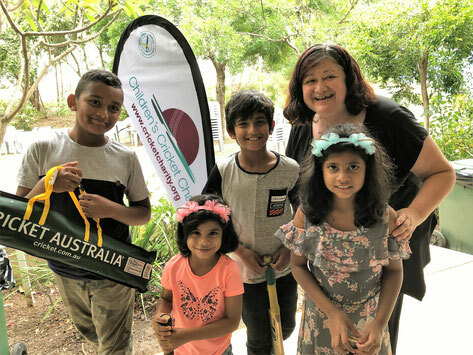 Children of Sri Lankan refugees living in Sydney were excited to receive Christmas cricket care packages donated by Cricket Kindness founder, Tamara Lowe in 2017.